“Jersey’s where America’s at!” – Some guy in Todd Solondz’s Storytelling. What’s the deal with New Jersey? On one hand it’s the great state that has given us talents from Philip Roth to Patti Smith, and on the other it’s the ongoing punchline for a thousand snobbish jokes told by New Yorkers who seem obvious as to the true greatness of the Garden State. 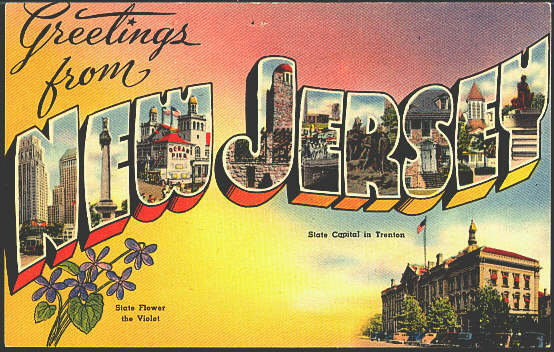 It’s the state that hosted the first recorded baseball game, the home of Thomas Edison, the grower of the greatest tomatoes on the East Coast, and the place that gave us Bruce Springsteen. Its numerous imperfections, its vast accomplishments, and its industry make it the quintessential American state. Teaming up with Akashic Books for the release of the New Jersey version of their popular Noir book series, on November 17th, Vol. 1 presents the latest installment of its Civic Pride Series; all stories about, or by readers from the state of New Jersey. The event will take place at WORD, and is free. Please RSVP at the Facebook invite. Barbara Browning’s first novel, The Correspondence Artist, was published by Two Dollar Radio in March 2011. TDR will publish her second novel, I’m Trying to Reach You, in March 2012. She teaches in the Department of Performance Studies at NYU and is also a dancer and a poet. Jackie Corley was born in 1982. She developed Word Riot in March 2002 with the help of Paula Anderson. Word Riot Press, an independent publishing company, evolved out of the magazine in January 2003. Her writing has appeared on-line at dispatch litareview, MobyLives.com, 3AM Magazine and Pequin, among others, and in various print anthologies. Her short story collection, The Suburban Swindle, was published in October 2008 by So New. A. N. Devers is the editor of Writers’ Houses (www.writershouses.com) a website that publishes essays about the art of literary pilgrimage. She is a frequent contributor to Tin House. Her writing has also appeared in publications including Bust magazine, the Brooklyn Rail, The New Yorker’s Book Bench, The Paris Review Daily, The Southampton Review, The Rumpus, TimeOut NY, and The Washington Post. Her essay, “On the Outskirts” received Notable distinction from The Best American Essays 2011. Amy Klein is a freelance musician and writer. She lives in Brooklyn but hails from the great state of New Jersey. She is also known as the founder of a young feminist group called Permanent Wave. Maris Kreizman is the creator of Slaughterhouse 90210, a Tumblr blog that combines her love of literature with her deep appreciation for crappy television. A former book editor, she’s currently the audiobooks editor at eMusic. Hirsh Sawhney moved to Jersey City in 2009, when he received a fellowship to teach and study writing at Rutgers-Newark University. In addition to contributing to New Jersey Noir, he is the editor of Delhi Noir, published by Akashic Books, which is being translated into French and Italian. His writing has appeared in the New York Times Book Review, the Guardian, and Outlook Traveller. He is working on his first novel.